About midnight on Sunday, or I guess really, Monday morning, I decided to put up my Valentine's Day mantle after a super crazy weekend. I pulled it all together with items that I've used in years past, items that I've just had around the house or in a cabinet, and a few new pieces that I made this year. It is a rather simple mantle, and I still may tweak it here and there, but for just grabbing items around the house, I like how it turned out! 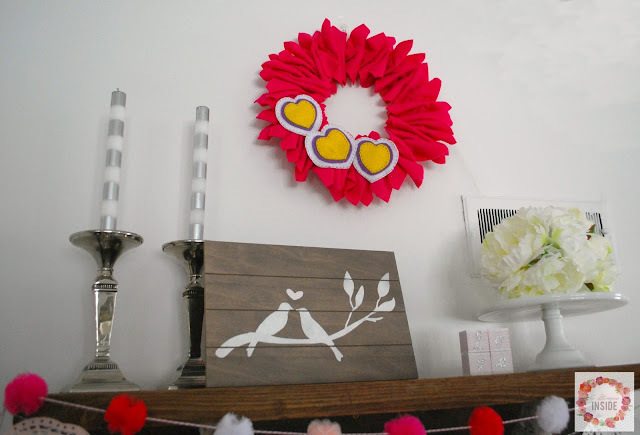 I hung the Felt Ruffle Valentine Wreath that I created a few years ago on the wall above the mantle. Took come candles and candlesticks out of a cabinet and placed on one end. 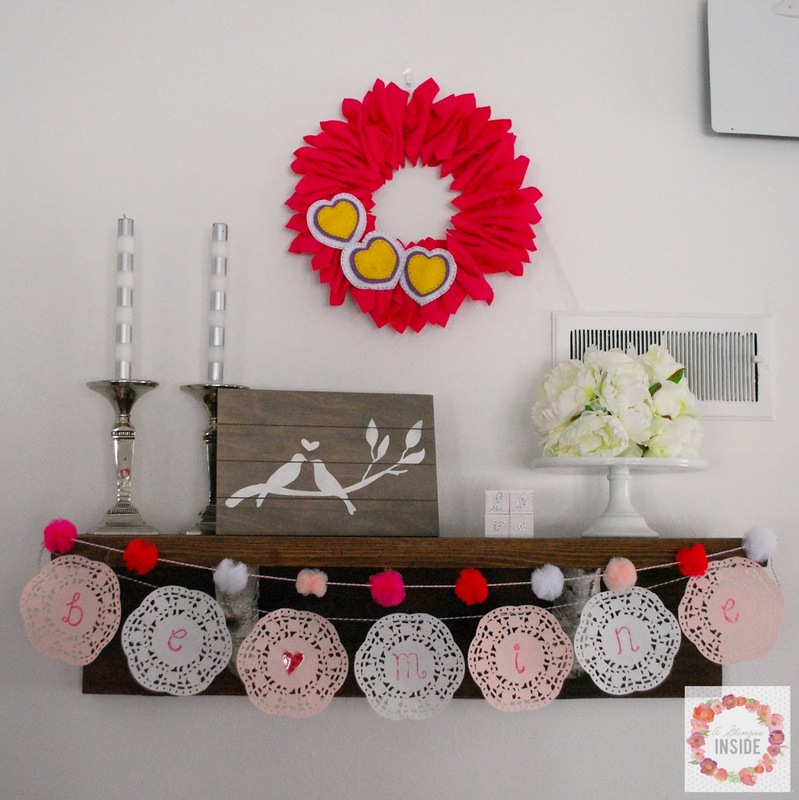 The Love Birds sign that I shared last week sits in the middle of the mantle with the "love" valentine stamped blocks sitting next to that. Lastly, I pulled out a cake plate and put some flowers on top. So I have a little secret about this. I've had these flowers since Miss P's 4th birthday party and they are cut pretty short. I've wanted to do something with them forever and wasn't sure what so when I was thinking about what to do I thought about these flowers. 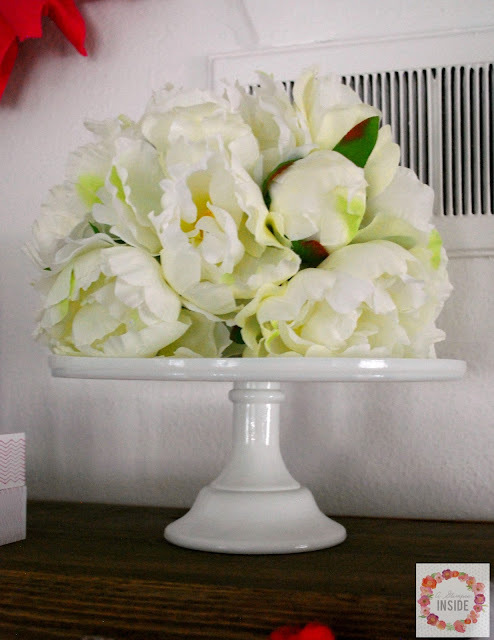 They are too short to sit in a vase but I knew I had a styrofoam ball and I could make a kissing ball with them by shoving them into the ball. I only had enough to cover half of it but the flowers were large enough to spread and cover the perfect way that you can't even tell unless you pick it up! And lastly, across the front I hung the "be mine" banner I shared yesterday along with some tulle pom-pom garland that I found in the dollar spot at Target. I am happy with my midnight mantle.